Prostate Cancer UK is launching its biggest marketing push to date, as it enlists celebrities Damian Lewis, Charles Dance and Sir Michael Parkinson to encourage men to sign up to its "Men United" campaign. The "Men United v Prostate Cancer" campaign uses the language of sport to engage the UK’s men, featuring a TV ad directed by Daryl Goodrich and filmed at Millwall FC that goes live during the FA Cup Fourth Round tomorrow, 25 January. 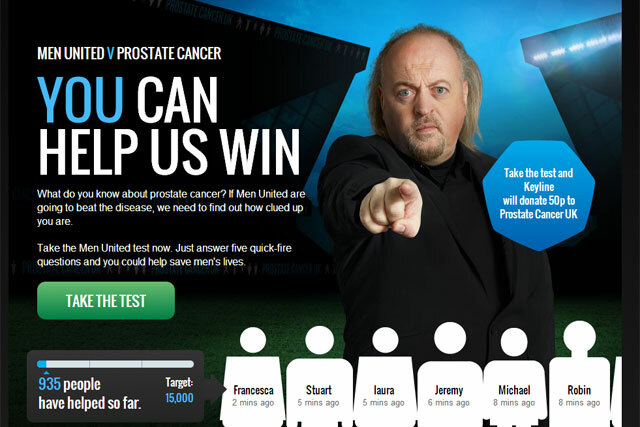 Premiering at half time, the ad shows comedian Bill Bailey calling on men to sign up to the Men United campaign and beat the "dad’s disease". The work is set to run for a minimum of two years and the charity claims the initial burst of activity will reach up to 96% of men and women over the age of 45 in the UK. The campaign is supported by print and digital work and encourages men and women to go online and sign up for the Men United team, and to join celebrities by wearing the "Man of Men" badge. Prostate Cancer UK claims that the disease kills a man in the UK every hour but can be treatable if caught early. A study of 500 GPs showed that 90% believe it is important that high risk men should be more proactively encouraged to speak to their GP about available tests. Vivienne Francis, the charity’s director of communications, said: "We are also expecting to see an increase in sign-ups for fundraising events, more people getting involved in our work, and an increase in donations and other forms of support. "The Men United campaign replaces an awareness month. We don’t just want to catch people’s eyes, we want lasting relationships. Prostate Cancer UK is all about engagement, generating conversation, activity, and action around the key issues in men’s health. "Being ‘aware’ for one month and dormant for eleven isn’t what we’re about. Prostate Cancer UK is there for men 24/7, funding research, offering support and leading change all year, and the interactivity of Men United v Prostate Cancer reflects that."